It’ll come as a surprise to nobody that the Super Bowl is the most watched single-day sporting event in the world. What might be more surprising is that the event that comes in second is the Boston Marathon. The event inspires all kinds of reactions. For runners, admiration and possibly envy. For couch potatoes, a certain degree of disbelief. Sports massage therapists see hundreds of potential clients, and an opportunity to spread the word about their profession. But this year, every massage therapist, whether they work on athletes or babies, has an extra reason to pay attention to the Boston Marathon, because representatives of the Massage Therapy Foundation will be running to raise money for its programs. “Year after year we see so many charitable organizations raising thousands of dollars for much needed causes. When we look at the work the Massage Therapy Foundation does in the line of research, community service grants and education on its budget, it is only fitting that we join those other organizations in receiving bibs to raise money for all the worthwhile work the foundation is doing. Mary White isn’t the only AMTA member who’s excited about the Massage Therapy Foundation’s involvement with the Boston Marathon this year. Usually, runners must meet a certain qualifying time on a certified marathon course in order to enter the event. But as part of the Non-Profit Bib Program, organizations are granted a few guaranteed spots (in this case, three of them) for fundraising purposes - and this is great news for New Jersey AMTA member Kathy Borsuk. Kathy started running only a year ago, after a lifetime of hating the idea of running. She’s never run a marathon before. But the same dedication that took her from being unable to run a quarter of a mile without gasping for breath to running a 5k in under 29 minutes in just a few months is pushing her to train for Boston on behalf of the Massage Therapy Foundation. How can you support Kathy? You could stop by her training blog and leave her an encouraging comment. You could share her story with others on Facebook and Twitter. But most importantly, you can donate to the Massage Therapy Foundation, the cause she’s running to support. Visit Kathy’s fundraising page and help her meet her goals, whether you can contribute $20 or $200. 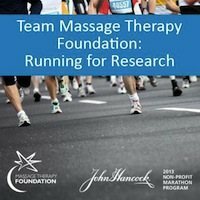 By contributing to this fundraiser, you’ll help show the world that massage, like running, can be an important factor in health and wellness. We can’t all run in the Boston Marathon like Kathy Borsuk, or head up one of the most prestigious sports massage teams in the country, like Mary White. But we can all appreciate those who do, especially when it’s for a cause we believe in and an organization we depend on. Best of luck to the Massage Therapy Foundation team!